We're excited to announce that the Army Builder Roster Viewer is now available on the App Store! This new, free app provides you with multiple views of your saved rosters, including a standard print-style list, a "card view" with individual cards for each unit, a mobile view optimized for use on the iPhone, or a simple text summary, tournament summary or model list. Find out more about the Army Builder Roster Viewer now! For miniatures gamers, the Army Builder brand roster construction tool is as vital as glue and paint. But why have over 40,000 miniatures gamers chosen Army Builder? Army Builder will save you hours of preparation, speed up game play, reduce mistakes, and even open up the door to new possibilities in your favorite games. Even one of these benefits would be worth the investment, but Army Builder offers all of them. 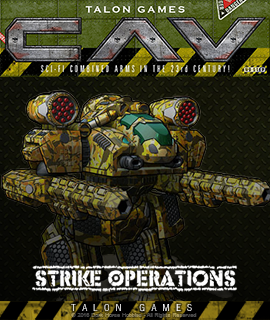 It's no wonder Army Builder has revolutionized the world of tabletop miniatures gaming. Build rosters in minutes - Army Builder handles the bookkeeping for you. No calculators - No mistakes! - Make unlimited changes without reaching for your spreadsheet or calculator. Instantly verify rosters are legal - Army Builder re-validates your entire roster with every change you make, ensuring compliance with the rules. Try Army Builder for free, and see for yourself why it's the industry standard used by miniatures players worldwide! 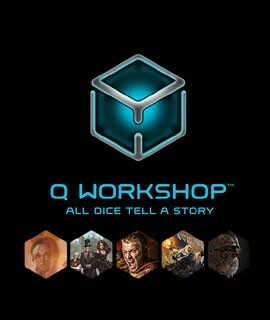 Important Note to Collectible Miniatures Game (CMG) Players! Card Vault is better suited for use with collectible miniatures games. 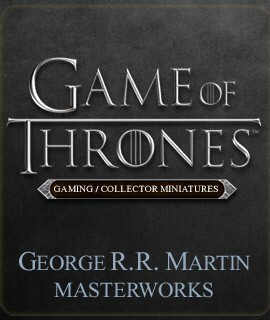 Not only can you build your armies, you can also track your collection. If you play CMGs, check out Card Vault. Create rosters for virtually any point-based miniatures game system with point-and-click simplicity. 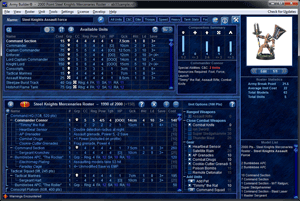 Data files can be created using the included tools and have already been created for the majority of games. Running point totals for units and the entire army are maintained on the fly as you edit your army, allowing you to rapidly experiment with different combinations - Army Builder does the math. Automatic validation is continuously performed, pin-pointing each problem to the specific unit or group of units that are at fault, and providing detailed information about what the problem is. The moment that you make a change to your roster that results in a rule being broken, you are immediately notified. Save rosters as HTML, text or BBCode, making it easy to share your creations online, with or without point costs shown. Print preview allows you to check how your roster looks before printing it. Generate "Mobile Output" for your roster and view it on your iPhone or other mobile device, or create a model list that consolidates your roster into a "What to Bring" list. Customize your roster to suit your needs. Adjust the fonts, sizes, colors, and styles of the content. Adjust the widths of columns, as well as which columns are included and the order they appear in. Even add your own custom watermark images to your roster. 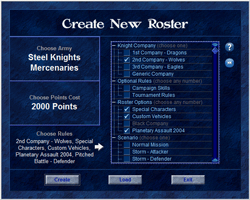 Point-and-Click Simplicity - Create rosters for virtually any point-based miniatures game system. Data files have been created for dozens of game systems, with more being released all the time. Quickly Experiment with your Roster - Since Army Builder takes care of the math for you, you can make rapid changes to refine your army list. Add a new item, subtract some models from a unit, change the rules for the roster - Army Builder instantly recalculates all the numbers for you. Information at your Fingertips - View the details for every unit, including stats and a summary of special rules. Know Your Options - See a complete list of all the available options (e.g. weapons, armor, etc.) for every unit, including a description of the option and it's cost. Only options valid under the current circumstances are displayed, so mistakes are avoided. We Keep Track of the Math - Running point and composition group totals for units and the entire army are maintained on the fly as you edit your army, eliminating the need to do the math and making it very easy to experiment with different combinations. Option Conflicts Avoided - You receive automatic notification of conflicting equipment options, eliminating potential mistakes. 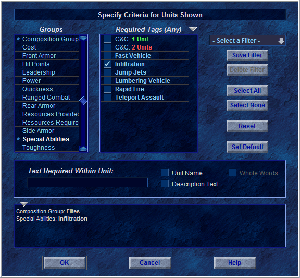 For example, if a unit can only choose one type of armor, selecting one type automatically disables the other options. Automatic Stat Adjustment - The effects of all equipment and items are automatically factored into the stats for each unit. Forgetting to add in that critical +1 adjustment during game-time is a thing of the past. Instant Validation - Automatic validation is continuously performed, pin-pointing each problem to the specific unit or group of units that are at fault, and providing detailed information about what the problem is. The moment that you make a change to your roster that results in a rule being broken, you are immediately notified. Drag-and-Drop Functionality - Drag-and-drop units to add them to the roster, or to group units together into squads of related troops. Switch Rules Seamlessly - For game systems with multiple variations and/or special army sub-types, change rule configurations on the fly and Army Builder will automatically adapt to the new set of rules. Adaptable Interface - Customize the interface to show exactly the information you want and in the format you want to see it. Sort the list of units by any criteria, or filter it to show only the units you want to see. PDF, HTML and Text Output - Save rosters as PDF, HTML and text files, making it easy to share your creations online. Mobile Device Output - Save your roster to a "mobile friendly" output format, for viewing on your iPhone or other mobile device. Touch a unit name and it expands, displaying all the unit details - touch it again to hide it. Unit options can also be displayed with a single touch. Print Preview - Double-check your roster before printing it with the Print Preview feature. 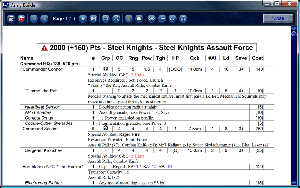 Printed Output - Generate a detailed printout of your roster, complete with descriptions of each unit, each equipment option, and every special item selected. Printed rosters include notes and reminders that reduce the need to look up basic rules during the game. Print Customization - Customize your printed roster to suit your needs. Adjust the fonts, sizes, colors, and styles of the content. Adjust the widths of columns, as well as which columns are included and the order they appear in. You can even add your own custom watermark images to your roster. Model List Output - View the combined model list for your roster, including how many individual models of each type are required, and the equipment they need. Turn your roster into a "what-to-pack list" with a single click! Automatic Updates - Automatic notification of updates to Army Builder and data files ensures that you always have the latest releases. 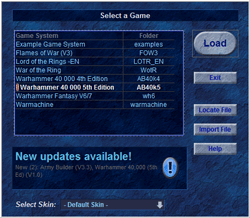 Simply select the update(s) you want and Army Builder will download and install them with a few mouse clicks. Customizable Units - Specify custom names and notes for all units, even your General's trusty steed. These notes appear on roster printouts and provide a valuable tool for tracking a unit's progress in a campaign or adding reminders for use during game play. Save & Load Individual Units & Squads - Save individual units and re-load them into other rosters. You can now design individual units/leaders and quickly build a roster from these component elements. 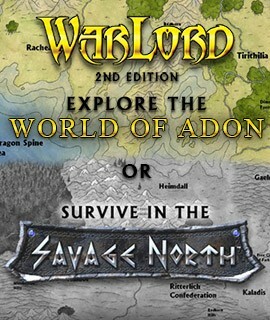 This is ideal for campaigns and leagues. Army Builder is compatible with dozens of tabletop miniatures games, includingFlames of War, Warhammer 40,000, Lord of the Rings, Warhammer Fantasy, War of the Ring, Warmachine, Hordes, Confrontation, and many others. 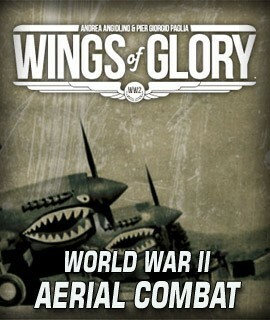 To see a list of games for which Army Builder data files have already been created, click here. 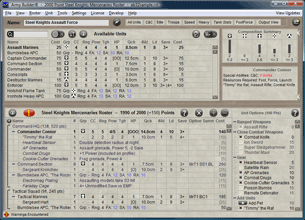 Army Builder is built around a general purpose engine for roster creation, making it suitable for use with fantasy, science fiction and historical games alike. All of the particulars of a given game system are encapsulated in a set of data files for that game system. The user selects the game system he wants, the corresponding data files are loaded, and the product configures itself for the mechanics of that game system. Because different miniatures games vary so much, the data files for them are written separately from Army Builder. These data files are generally made available to other users as free downloads that can be retrieved directly by the product. This method allows the data files to be updated regularly as new supplements are released for games, and allows users to download the specific files for the games they want. A complete toolset for creating data files and/or customizing existing data files is included for free with your Army Builder download. 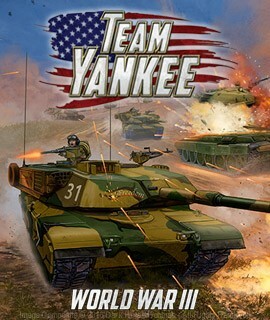 This Construction Kit makes it possible for gamers to write complete data files for a game system or simply modify existing data files to add their own custom troops or make adjustments for house rules. ABCreator, the primary tool included with the Construction Kit, works similarly to many database programs - the user fills out a form for each unit, item or option that Army Builder must keep track of. A valuable tutorial is included that outlines how to utilize the tool, as well as further documentation for advanced data file authoring.